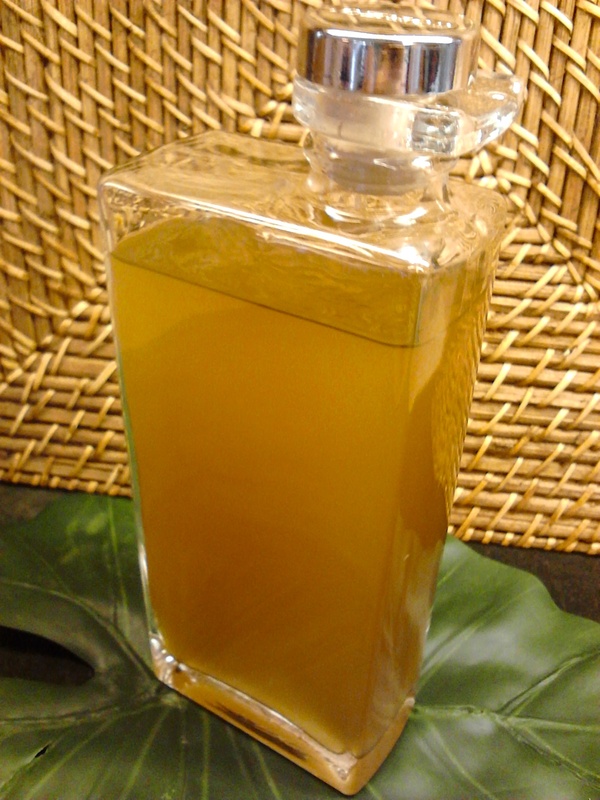 It is essentially a syrup with a robust flavor, not necessarily strong with alcohol even though the following recipe shows a version made this way. I’ve heard it mostly goes with rum drinks, yet a buddy of mine swears by it with whiskey. Like a syrup flavored with raspberry, or cinnamon, or mint, or anything you enjoy going in your cocktail, falernum is a rich combination of flavors mixed with simple syrup. Understandably not as easy to make, I think it’s a lot of fun to make. There again, I like making my own syrups. 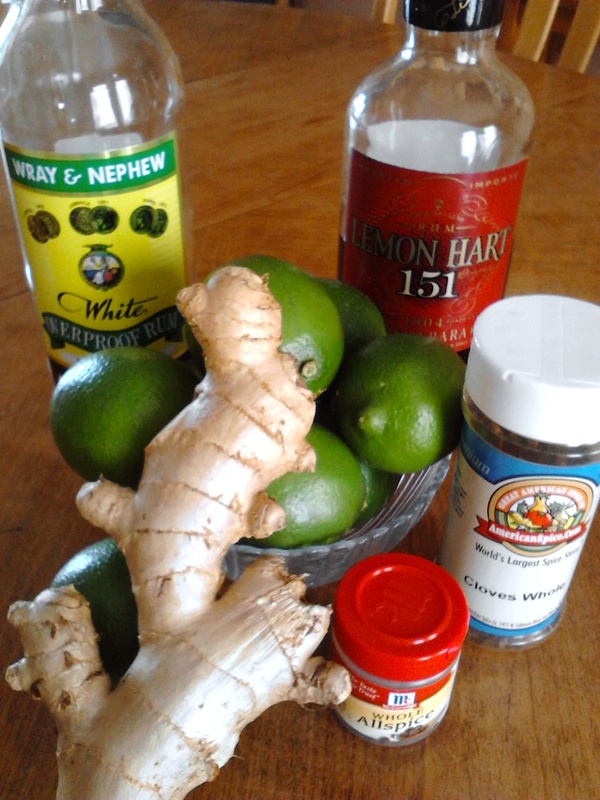 If you want a gist of it, think of ginger, clove and allspice together, with suggestion of lime. What is curious is how over-run the flavor of lime is, particularly after looking at how much lime zest is added. I selected possibles from a number of recipes I’ve found. My first attempt last year turned out such a success, I not only wanted to keep making the stuff, and making different recipes, but wanted to continue into experimenting, even in error. So please don’t read only my recipe, but look around to find other recipes. First, if you prefer to keep your overproofs single, go with the Wray & Nephew. That’s how I did it last time. I’ve been itching to try the combination since getting my first bottle of Lemon Hart (a thousand thank yous Watson). Measure your spirits and pour into a wide-mouthed jar or bottle. Please do not try to stuff the ingredients into a 750ml bottle only to find how difficult it would be to get it all out afterwards. Toast the cloves and allspice over medium heat until fragrant. It might help to get fresh spices, which only makes sense. But at the moment I am not practicing common sense and using old spices, hoping the toasting will make up for the difference. After tossing your warm spices into the jar, peel the skin off the ginger, chop the ginger julienne style (meaning thin sticks). As you can see by the picture I sliced mine thin instead, my own experiment. 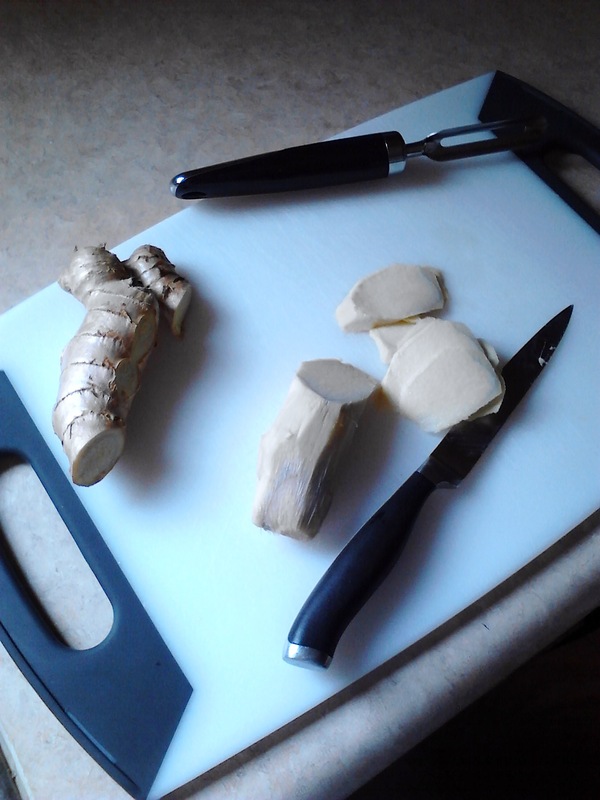 Every recipe I have ever read using ginger insists on julienning. Either use a fine zester or a sharp peeler, get the green part of the skin off the limes. The white part underneath is bitter, only the zest. 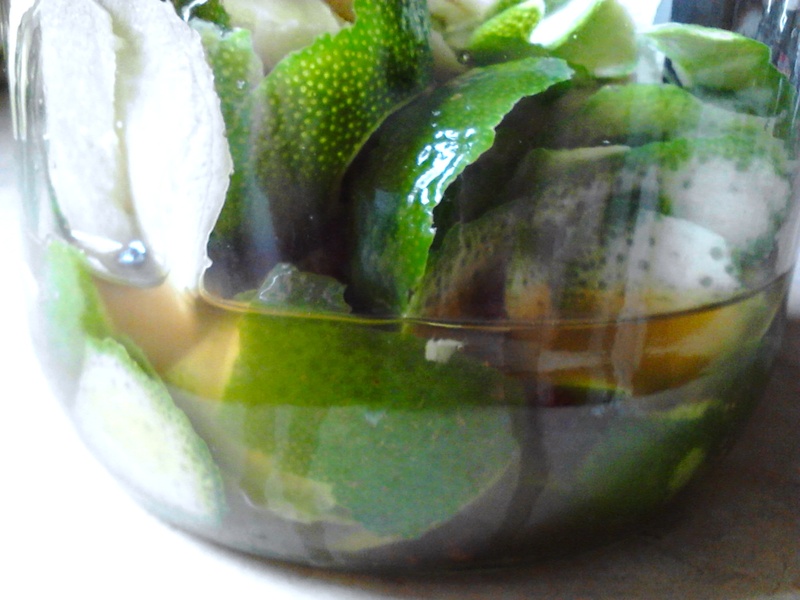 After your falernum is complete, you may want extra lime flavor, which many may, this is when you would add lime juice. Please do not make your falernum with the juice of the lime. It will lessen the lifespan, causing little black dots. I don’t think I need to tell you what those little black dots would be, let alone what they’d do to you if you drank enough of them. The zest is ample enough for a robust sense of lime, even though I truly understand the need for the freshness only the juice produces. I typically add falernum to rum drinks anyway, and would add lime juice whether I was indulging in falernum or not. Next, close the lid on your container and give it a good mixing before closing. You’ll keep that lid on for 24 hours. I haven’t heard of a need to refrigerate, so out of the sunlight is best, as long as the lid is on tightly. 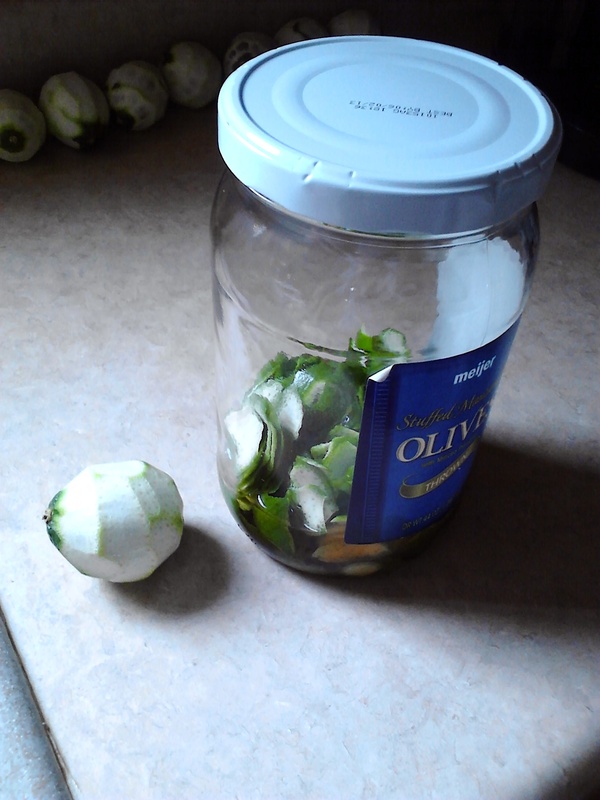 Now it’s time to figure out what to do with all these peeled limes. The next day, make the simple syrup, which is 2:1 sugar to water. Actually that’s rock candy syrup. Simple syrup is 1:1 sugar to water. But in my house my syrup is thick, never thin. At least that’s what Rule #43 says on my refrigerator. After all the sugar is absorbed, and to the touch your syrup is room temperature (unless you made it cold process, which is with cold water), set the syrup aside. Drain the day before’s ingredients through a fine mesh strainer, preferably through cheesecloth – something you can wring out all the possible flavors (even the last drop will improve the end result). Discard the solids. Mix into the syrup, and add the final touch: 10 drops of almond extract, gently stirring it in for bottling. Then make your first drink. And make it cold. My first one will be a Mai Tai. For those of you in camp Trader Vic, I enjoy your Mai Tai too. It is an excellent drink. I simply prefer Don the Beachcomber‘s, reserving any opinion into which drink came first. As long as we are toasting, I genuinely don’t care.